Chemically blackened steel spreader plates. An essential tool for retracting the brake piston to allow insertion of new brake pads. Suitable for most ATE, Bendix, Delco and Girling callipers. Fitted with tommy bar but can be used with 1/2 Sq drive ratchet wrench or spanner. Chemically blackened steel spreader plates. (2"x2-1/4") Each plates. Chemically blackened steel spreader plates. (2"x2-1/4") Each plates. 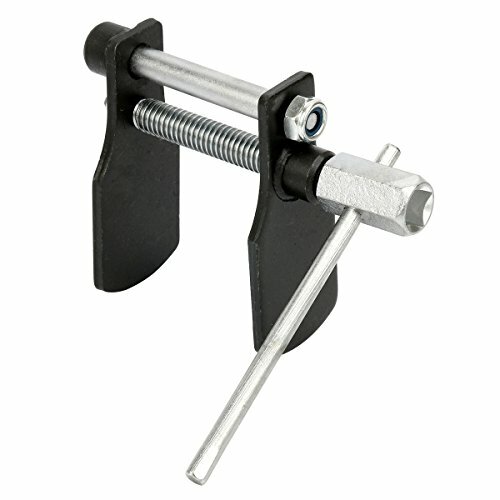 Max Spread 3-1/4"
Essential tool for retracting the brake piston to allow insertion of new brake pads. Fitted with tommy bar but can be used with 1/2 square drive ratchet wrench or spanner.